Brian Klaas is the author of The Despot’s Accomplice and a Fellow in Comparative Politics at the London School of Economics, where he focuses on authoritarianism and democracy. Klaas received his doctorate from the University of Oxford. He has advised NATO, the European Union, national governments, and major international NGOs. He previously served as a US campaign adviser. Klaas is a columnist for DemocracyPost at the Washington Post and is a regular contributor to USA Today, Foreign Affairs, Newsweek, the Financial Times, the Los Angeles Times, and The Hill. He is also a regular guest on MSNBC, CNN, CNBC, Bloomberg, BBC News, Sky News, and National Public Radio. He is an American currently living in London, UK. "Brian Klaas uses his knowledge of the world's despotic regimes to shed light on authoritarian tendencies in contemporary America. A chilling reminder of the very real threats that the Trump administration poses to American democracy, and essential reading for those who want to do something about it." "Thank goodness for Brian Klaas. At a moment of unprecedented political crisis for the United States, he's one of the very few experts to offer a much-needed global perspective on the Trump phenomenon. Trump, he shows, is less of an exception than part of an ominous global trend: disillusionment with democracy. A sharp-sighted and urgently needed book." "The Despot's Apprentice is morally righteous in the best sense of that word. Brian Klaas offers an erudite and persuasive plea to resist both budding and aspiring dictators, both in the United States and around the world." "Donald Trump may not be a dictator (yet), but he sure would love to have the opportunity. 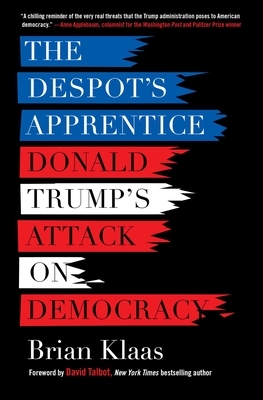 With The Despot's Apprentice, Brian Klaas puts his extensive history researching authoritarian leaders to use to analyze how Trump undermines American democracy, giving readers valuable insights they will need to continue resisting." "If you care about American values, our Constitution, democracy, freedom of the press, the rule of law, and the future of your children and the planet—read this book!" "This is an important book for all who want to understand and do something about the crisis of democracy in our turbulent world. Klaas tells a disturbing story, but he offers hope—and a dose of humor—while showing how the West can turn the tide, if it acts wisely and quickly. Essential reading." "For the last few decades, liberal democracy was on the march. Today, however, the world is going through a democratic recession. In this thought-provoking book, Brian Klaas points the finger at a surprising villain: the West itself. He argues that Western governments have too often been accomplices to authoritarianism; through sins of commission and admission. An enjoyable and challenging addition to the literature on democracy promotion." "This lucid, wide-ranging, up-to-date analysis of US democracy promotion offers penetrating critical insights as well as practical recommendations for doing better. Klaas is an engaging, lively guide through the complex thickets of democracy policy challenges and dilemmas." "This efficient and thought-provoking plea for the U.S. and other Western countries to prioritize democracy promotion is a must-read... [Klaas] is no armchair academic, and his analyses of policymaking challenges are informed by extensive, and sometimes dangerous, field work... [He] is able to make his points simply and clearly, as in his observation that democracy, like free speech, must be protected regardless of whether it yields a preferred result." "A thorough and thought-provoking primer on the threat to democracy posed by—and I can't believe I'm saying this—the current president of the United States." "Written with precision and learning, with lively prose and dark humor. Klaas' proposals combine the conviction of an idealist with the experience of a technocrat. At a time when democracy is in retreat and the world seems headed for turbulence, this book can be the shot that revives this ailing patient."